We have all the products necessary to maintain your system at our retail outlet – our experts will help you every step of the way! Change to Salt Water — Do it yourself or call our Service Department at 973-812-1975973-812-1975 to do it for you! Salt & Swim ABG salt chlorine generator is designed specifically for Above Ground Pools up to 23,000 gallons. 12-Volt Ready- plug and play is the most convenient and cost effective way to chlorinate your Above Ground Pool. Do-it-yourself installation in 20 minutes or less. The AquaTrol Electronic Chlorine Generator (also known as a salt chlorinator) is designed specifically for Above Ground Pools up to 18,000 gallons. The AquaTrol has all the same functions and features of the Aqua Rite but with a lower chlorine output. 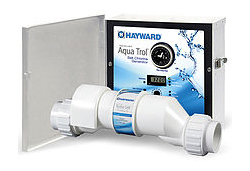 The AquaTrol also has an integral time clock for control of the pool filtration pump. Since many Above Ground Pools already have a single electrical outlet for the filter pump, the AquaTrol is designed with an outlet (timer controlled) for the filter pump to plug into, the AquaTrol then plugs into the original outlet the filter pump was using. The savings on chlorine and electrical power alone (if the pump was previously running 24 hours), will have the AquaTrol paying for itself in just a few short years. The AquaTrol system typically installs in less than 30 minutes and is very easy to operate.